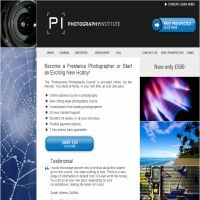 The Photography Institute is a well-respected online digital photography program that has been available to student photographers for many years. The program was developed by seasoned professional photographer George Seper who trained under the great Swiss photographer Hans Feurer in the late 1970’s, and has been published in Vogue, Mode Magazine, Cleo, GQ and Cosmopolitan fashion magazines. This fully comprehensive course offers students the most advanced alternative to classroom photography training, for the benefit of freelance digital photographers. This complete home study course includes 12 modules that are jam packed with information and instruction to help photographers learn all the tricks that the pros know in a convenient, self-paced format. When taking the course, students have access to the training materials that are delivered online in 12 modules that contain 12 interactive digital photography assignments, which typically take the average student 24 weeks to complete. Each student gets his or her own photography website with full access to the first module’s materials from George Seper, with complete instructions and guidance for getting the assignments done. Students are also assigned a personal tutor for added support. The format of the course includes information from real working professional photographers who are actively publishing in their chosen focus area. From fashion and wedding photographers, to action and outdoor photographers, you will have access to a wide range of tutorials, which will help you get out there quickly and take great photos. While this is a little more in-depth and somewhat more costly digital photography course than some of the other courses we’ve reviewed, you do not have to have any prior knowledge of photography or have special computer skills to be successful in this course. The Photography Institute is designed for new and experienced photographers alike who have the desire to hone their craft and earn the credentials necessary to become better photographers whilst learning from a pro like George Seper. It’s like taking a complete college class, but with the personalized attention of a small group with an excellent mentor to show you all the ropes from a practical aspect. That knowledge alone can help you become a super photographer in just a few short weeks. What we liked the most about The Photography Institute is the fact that once you are done with the course, you will have earned a diploma in digital photography, which will give you automatic credentials, and pride in your accomplishments. You can display this on your photography portfolio, which you will get help in creating, as well as on your marketing materials. This will help you rise above all the other local photographers in your market. There are very few digital photography courses that offer this kind of diploma with the real tools you need to be a professional photographer. Want to learn more about The Photography Institute digital photography course? Be sure to click on the link below and take advantage of the limited time special money-savings offer here.